Mandatory recycling in Alameda County has been in effect since July 1, 2012 for businesses and institutions with 4 or more cubic yards of garbage service as well as multi-family properties with 5 or more units. Phase 2 of the Mandatory Recycling Ordinance begins July 1, 2014, which adds food scraps and compostable paper to the “Covered Materials” list and requires all businesses to participate. The Plant Debris Landfill Ban has been in effect since 2009. For the Mandatory Recycling Ordinance, the scope of participation and implementation timing differs among the jurisdictions. A summary of compliance requirements is listed below, however not all requirements are effective in each jurisdiction. For details about the compliance requirements in the various Alameda County jurisdictions, go to Rules by City. The following requirements apply to all commercial property owners, property managers and institutions such as hospitals and nonprofit organizations located in jurisdictions that have fully opted-in to the Phase 1 and Phase 2 Mandatory Recycling Ordinance requirements. Requirements denoted with an asterisk (*) are not required in each participating jurisdiction. Businesses and institutions that generate significant quantities of organics (food scraps and/or compostable paper), such as restaurants and grocery stores:** Provide containers and service of sufficient number, size and frequency for organics. Businesses and institutions that generate significant quantities** of organics, such as restaurants and grocery stores: Place food scraps and compostable paper in separate organics cart/bin for organics collection. ** The Ordinance prohibits the disposal of any food scraps or compostable paper in the garbage. However, for practical use, organics are considered to be “significant” when 10 or more gallons (think two 5-gallon buckets full) are disposed of in a garbage cart or 20 or more gallons (four 5-gallon buckets full) of organics are disposed of in a garbage bin. 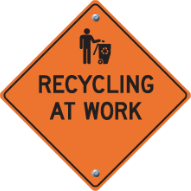 Recommended: Property owners and managers should post prominent signs on or near the recycling and garbage containers clearly indicating which are for garbage and which are for recycling. Signs are available for download here. The property owner is responsible for ensuring compliance with the requirements of both the Mandatory Recycling Ordinance as well as the Plant Debris Landfill Ban Ordinance. If the property owner enters into a written agreement with another party that contracts or arranges for solid waste service (e.g., property manager or tenant), that party is also responsible for compliance. Visit the Businesses and Institutions Support Materials page for resources to support your recycling and composting program, such as posters, decals, sample employee or tenant notification letters and an internal container count worksheet. Information and assistance with recycling, organics and garbage service: Find your service provider or city contacts at Rules by City. Technical assistance is also available from the Business Assistance Team by requesting help on the online request form or by calling the Ordinance Help Line at 510-891-6575. For additional information or questions, contact us here.